On Friday February 2, the Fédération des médecins résidents du Québec (FMRQ; i.e. Federation of Quebec’s Medical Residents), voted in favour of an unlimited strike mandate. Out of the 3,600 members of FMRQ, a professional union representing medical resident associations from the universities of McGill, Montreal, Sherbrooke, and Laval, 97 percent voted in favour of a strike, with 99 percent of McGill residents voting in favour. According to Christopher Lemieux, the president of the FMRQ, this is the highest proportion of favorable votes from Quebec’s four medical residents associations. Negotiations between the Quebec’s Ministère de la Santé et des Services Sociaux (MSSS; i.e. ministry of Health and Social Services) and the FMRQ started eighteen months ago, in the fall of 2016. After 16 meetings between the two parties, and an intensification of negotiations in late 2017, they reached a stalemate in December 2017 as the government’s position had remained mostly unchanged. The last collective agreement between MSSS and FMRQ has expired March 2015. Medical residents are workers of the health system employed by hospitals, but affiliated with a university. *Robert, a medical resident at McGill University Health Centre, told The Daily that medical residents are paid a fixed annual salary, without remuneration for overtime work. Under the 2015 collective agreement, a first year resident earns a fixed salary of $44,552. The salary is calculated on an annual basis rather than an hourly basis. The yearly wage, when factored in with the 72 hour per week workload, amounts to 11.9 dollars per hour of pay. As of May 1 2018, this will be less than the new provincial minimum wage of twelve dollars per hour. According to Lemieux, residents’ salary is on average twenty seven percent less than what a Specialized Nurse Practitioners (SNPs) would earn with the same amount of experience. The FMRQ are demanding a 17 percent increase in remuneration for medical residents. According to Lemieux, residents in the province of Quebec have the lowest salaries in Canada; there is a thirty percent gap in wages between Quebec and other provinces. Residents are also asking for a new contract for maternity leave, as medical residents do not receive their full salary amount on leave. “The MSSS only calculates their remuneration on [a] leave basis on their base salary. […] As a consequence, female medical residents are disadvantaged relatively to other professionals when they go on maternity leave. “On average, medical residents work 72 hours per week; it is difficult for us to work more,” told Lemieux, emphasizing a need for change in working conditions. In 2009, Quebec outlawed 24 hour shifts for medical residents in response to a grievance filed by McGill residents, as shifts longer than 24 hours endanger both patients and residents. This point was reiterated in the case against the McGill University Health Centre in 2011, where 24-hour shifts required of medical residents were deemed to violate the Charter of Rights and Freedoms. According to the evidence used in a case led by the FMRQ against the McGill University Health Centre, medical residents are 2.3 times more likely to crash their vehicles after working 24-hour shifts. According to the evidence used in a grievance case led by the FMRQ against the McGill University Health Centre, medical residents are 2.3 times more likely to crash their vehicles after working 24-hour shifts. Lemieux mentioned that medical residents are also responsible for multiple duties which include teaching medical students, and various academic obligations. “We are still in transition on certain points. Consequently, after work, we have readings to do, presentations to prepare, and research projects to work on,” said Lemieux. On September 19, 2011, the FMRQ had mandated a strike during salary negotiations with the government. The strike, which occurred from 8am to around 11:30 am resulted in an agreement which included a 20.3 percent increase in salary over five years, and a 6 percent annual increase in salary, a doubling of on-call hourly wages, and a $210 teaching stipend for every rotation. Lemieux told the Daily that the MSSS is currently unresponsive, and ignores medical residents’ demands. However, the FMRQ will not call a strike yet. Alongside having to work long hours, medical residents are subject to the stress of being constantly evaluated by their superiors. A 2017 survey revealed that 40 percent of medical residents had been intimidated by their superiors, and other hospital professionals, into working more. 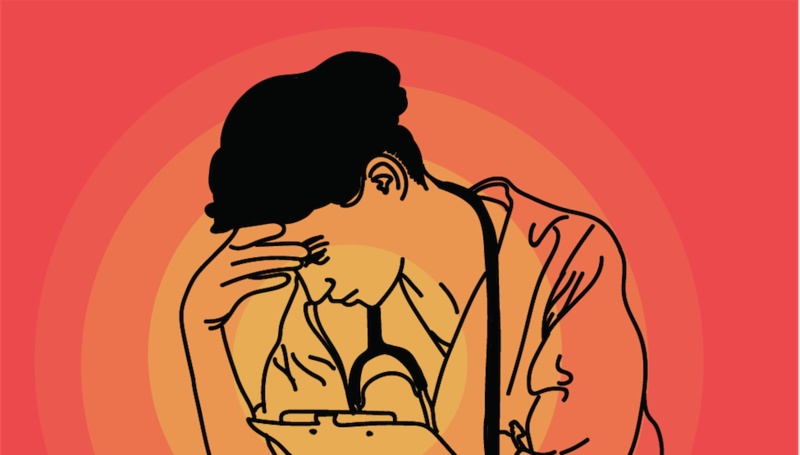 Surveys done between 2008 and 2011 showed that between 45 and 50 percent of Canadian medical residents have been victims of harassment, intimidation, and mistreatment during their residency. A 2013 survey done by Resident Doctors of Canada found that medical residents often experience yelling and shaming, racist and homophobic remarks, as well as negative and unconstructive feedback. He further explained: “I work really hard, but I burn out, because it is so important for me to impress my supervisors, and it’s like a bit of a pathology because I’m obsessed [with] it. […] At the end of the day, when you come home, and you have a relationship, you have friends, family, and you’re just burnt out. You’ve worked to get this for 72 hours per week.” A new study published in the Journal of the American Medical Association shows that thirty percent of medical residents have depressive symptoms, as opposed to eight or nine per cent in the general population. “The [residents] are seeing patients frantically, working furiously to get these kind of scores, so that they can […] achieve their dreams […] they’ve been treated in this way so that the system works,” said Robert. Robert detailed the evaluation criteria residents are subjected to, which determine a resident’s evaluation for each shift. Robert mentioned that professional expectations contribute to a disregard of personal needs, which is a normalized working condition for residents. *Janet, another medical resident, spoke to the Daily about gender-based intimidation. “There’s still a subculture that’s not really spoken about that glorifies stereotypically masculine traits as better than stereotypically feminine traits. […] It’s very patriarchichal. […] It’s a strange dynamic because the majority of the residents and medical students are women, but more staff are men with […] preconceived notions about gender roles,” said Janet. According to a Canadian Medical Association survey done in 2017, the proportion of male and female doctors is almost equal (48 percent female; 52 percent male). Women are a majority in younger generations of doctors until the 45-54 age group. Senior professionals remain largely male supervisors, who conduct evaluations on a board range of criteria from ‘Interprofessional relationships with physicians’, to ‘sensitivity & respect for diversity’. Janet told the Daily that female residents “negotiate the role of being taken seriously” as medical professionals, but are pressured to “do the song and dance” as students who are evaluated by the same supervisors over a multi-year process.